I feel like one of the lucky ones. I have two of the BIGGEST cheerleaders in the world. I’ve been away on a few crazy trips (mission trip to Honduras, studying abroad in Italy, and a summer in Chicago). 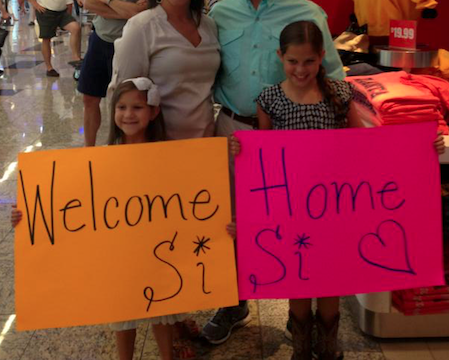 Each time I’ve returned home, my two little sisters would run into my arms and give me the most incredible embrace. Every time I would get a sense of relief. That feeling of, you’re home! And they were safe in my arms. They have always run into my arms when they would fall and scrape their knee, or if they were in trouble with mom and dad. They always trusted my embrace to make the bad stuff better. But the part I really love is when they would run into my arms out of joy and excitement. When they would embrace me out of pure bliss. I was driving home from dinner with them just the other day and having a little worship time in the car along the way. I was thinking about how good it had just felt when the girls ran to my arms because they had missed me and were so excited to see me. Then my thoughts began to reflect on all of the times I’ve run to God – seeking His embrace. It’s kind of similar. I’m so quick to run to His arms when I’ve fallen down or when things are just falling a part. But, I often fail to run to His arms out of happiness and praise. If I could guess, God appreciates when I run to Him out of joy just as much as I like when my two sisters do. I often forget that He likes to rejoice with me just as much as He likes to offer comfort. Our God longs for us to embrace His open arms – during our times of doubts, sorrow and disappointments. But just as much, He longs for us to run to his open arms with joy and praise. He likes for us to say THANK YOU for all of the things he’s blessed us with. It’s easy for me to recollect the times I’ve fallen into his arms when I’ve needed his comfort or to be picked back up. But when life is a big ray of sunshine, I seem to forget to say thanks and run to his big, open embrace. Thank you Jesus. For your comfort when I’m down. And your endless love when I’m up high.